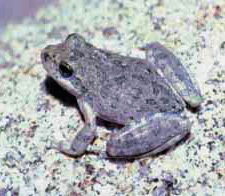 Above the steep drop of Kitchen Creek Falls, near Campo, we found three California Tree Frogs, each the size of my thumbnail. On the rocks, hunched up to make themselves small, they look like lumpy bumps of granite. In the water, they sink down below the surface in floating masses of algae bubbles and blend right in. Their mottled skin can pass for many things. but they reveal themselves in their motion: in the still pond, nothing else was moving but their tiny legs, pumping away. I dropped my hand underneath them in the water, and then brought it up, leaving the frogs high and dry on my palm. They sat still for a long time, and then — wheeeeee! Arms and legs stretched out like a star, they made the leap, like paratroopers fearlessly diving toward earth. Splash! They swam away! We brought our lunches to Balboa Park with aunts, uncles, cousins and had a picnic under a gigantic fig tree in the butterfly garden. It’s roots cascade down the stone wall that borders the garden like a living waterfall. We sat at the top, between roots that rise up four feet. The children sat in “pockets” in the tree. “Let’s find a pocket!” HIdden away from the grownups, they had their own society. Big trees are so comforting — such large beings sharing space with us, making room for us. It’s in the places that we make room for them, too, that we feel most at home. A crowd of children was playing in my backyard today. Two rushed in. Invite in a predator — find a gopher snake in the canyon and bring it back to the yard? Build a hawk perch on the fence (he’s too far underground to be bothered)? Find a trap and release trap — I got in trouble once for release a field mouse in a city-owned field, so that doesn’t sound appealing. As a nonfiction writer, I have always wanted to capture the things that I feel are most beautiful and amazing in the world — icy night air, white moonlight, the mouse chewing somewhere in my kitchen wall tonight. When I was 18, I longed to capture the fragrance of the canyon near my house — savory sagebrush, sweet buckwheat — so I could smell them always. I filled my coat pockets with their crumbled up flowers when I went East for college, and kept my pockets filled all winter, pulling out a handful to smell when I needed to reconnect with the earth, or with my self. I could never capture that smell in words, though that was my ultimate wish. Not for a lack of trying. This video lives on my computer — courage, a few bracing words. Buck up, mate! Don’t quit. Try again! This advice is from Ira Glass and was on Joy Chu’s Got Story blog a few months ago. It is audio-visual courage. Thank you, Ira, Joy, and the wonderful video producer who turned Ira’s words into visual poetry. School Library Journal, one of the best places to find reviews of children’s books, has published a review of the best children’s gardening books of 2011. 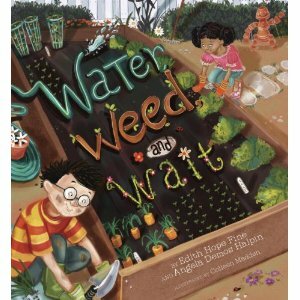 Check out Edith Hope Fine’s Water, Weed, and Wait, from Tricycle Press! It’s a lively story of a class that wants to build it’s own school garden and finds some unexpected community through gardening. Discovering the mysteries of family as I help my Dad simplify his life.